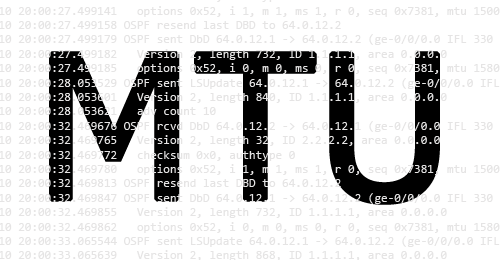 This will be a quick stop before we jump into MPLS LDP and TE, I have decided to write a brief post about the differences on MTU when working with IOS, IOS-XR and JunOS, so for this, I have extracted a part of the bigger topology that we will later use. Notice vMX-1 has placed 1514 bytes on the wire, this is because of the source/destination address (12 bytes) and ethertype fields (2 bytes) within the ethernet header, which by the way is explicitly stated as 1514 when we do the show interface ge-0/0/0 | grep MTU, this means the system is explicitly considering the 14 bytes for the ethernet header, we will see that is not the case with IOS-XE. CRC field is not taken into consideration here. That’s vMX-1 receiving and sending the DBD packet, notice the different MTUs, OSPF traceoptions logs are flooded with these now. Lastly, this is the XRv-2 saying it’s had way too many retransmissions and needs to bring the OSPF neighbor from EXSTART to DOWN state, then explicitly states, Nbr 1.1.1.1 has larger interface MTU, very straightforward. This will conclude the post, it is important that we can understand the different MTUs and how they interact across different vendors, specially when we start adding services to our network and, for instance, start adding MPLS labels and dot1q encapsulations.